The Black-winged Lapwing (Vanellus melanopterus) is also sometimes referred to as Greater Black-winged Lapwing or Black-winged Plover. This altitudinal migrant, breeding at highland inland areas in the summer, moving down to the coast for the winter. It is a habitat specialist of short grass in well-watered temperate grasslands. They generally prefer highland plateaus and slopes, meadows, fallow fields, pastures, coastal flats and cultivated areas, such as gardens or golf courses. The Black-winged Lapwing averages about 27 cm in length (including its tail) and weighs around 190 g. It is about the size of a starling. Male and female look alike. The upper plumage, its head and throat are grey. It has a prominent white forehead patch. A black chest band separates its grey head from the white underside. The wing coverts (feathers) are brown. The eyes are yellow; the beak is black. The legs are purple, with the color brightening during the breeding season. 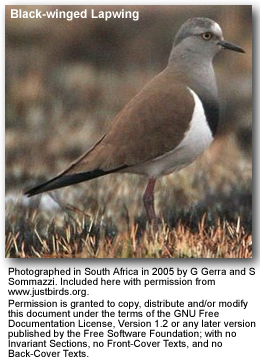 The Black-winged Lapwing looks similar to the Senegal Lapwing but can be distinguished by its white wingbars, which is visible in flight, bordered by black remiges (wing primary feathers). At night, their tightly grouped flying flocks often resemble Plovers. The Black-winged Lapwings are monogamous, forming tight pair bonds with their mates. Only when the mate dies, they will seek out a new mate. The breeding season usually commences in May and goes on through November; the peak being August to September. During this time, males establish territories by calling and displaying flights which may include exaggerated wing beats. These territorial solitary or loosely colonial nesters are often found breeding along with Spotted Thick-knees and Crowned Lapwings. The male Black-winged protects the nest from intruders by flicking their tails downward and bobbing the whole body back and forth. The nest is usually placed in a depression in the ground among grass or in newly ploughed land. It is lined with roots, small stones and dried dung. Other insulating nest lining is added until the eggs are half buried. The average clutch consists of 1 to 4 dark, green-colored eggs, which are incubated by both parents during the daytime, but only by the female at night. During the daytime, the parents usually work in shifts of about 90 minutes. The incubation generally starts when the clutch is complete. The incubation period is 30 to 31 days. The chicks remain in the nest for up to 24 hours after hatching. Once their down dries. they follow their parents who will take them to favorable feeding areas. The young are usually self-sufficient when they are about 29 - 31 days old, but remain with their parents for about a year before leaving at the beginning of the following breeding season. Captive birds are typically fed earthworms and mealworms.